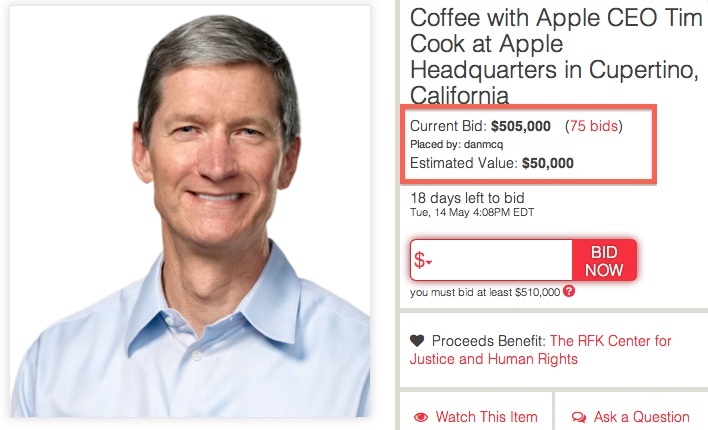 With a flurry of activity today, bidding on the charity auction for a coffee meeting with Tim Cook at Apple's headquarters has passed $500,000, nearly doubling the previous record for a CharityBuzz "experience" auction set last year when a bidder paid $255,000 to spend a day with Bill Clinton. The bid list seems to be a combination of serious bidders and those likely simply seeking visibility for their names or brands and relying on the fact that there are 18 days left to bid to hope that they won't actually win the auction. CharityBuzz notes in its FAQ that all bids are legally binding and can not be retracted. No, and we’re pretty strict about this. Here’s the legalese: All bids placed on the Charitybuzz website are legally binding. If you are the successful bidder, you will enter into a legal contract to purchase the item and will be considered the buyer of the lot. Please consider your bids carefully before placing them. The auction for coffee with Cook, which is part of a group of roughly 100 celebrity auctions supporting the RFK Center for Justice & Human Rights, will see the winner and a guest travel at their own expense to Apple headquarters to meet with Cook for 30-60 minutes over coffee on a mutually agreed upon date. Overpriced. There are cheaper and better-specced people to have a cup of coffee with on the market. 1985-1997: 12 years in IBM's personal computer business as the director of North American Fulfillment. Yah...he literally has no insight...27 years in the industry in key positions, of the two biggest computer companies...you're TOTALLY right. That's crazy, there's no way meeting with a CEO (any ceo) is worth that much money. I think they key part of this is that its for charity... its not just because he's the CEO of Apple. For people who normally contribute large sums of money why not get to chat with the CEO of Apple while you're at it? Also, they get to write it off on their taxes so they aren't really spending that money. Do you know what a write-off is? Say you donate $10,000 to some cause. That actual money has to come out of your bank account. You lose that ACTUAL money. Come tax time, say you made $50,000. You no longer have to pay taxes on $50,000, but instead $10,000 less than that, which is $40,000. Say your tax rate is 15%. Instead of paying $7,500 in taxes, you'd pay $6,000 in taxes. So, this $10,000 is actually costing you $8,500 if you count the benefits of a tax write-off. It's not FREE. Seriously, I'm sure someone will want to flame me. I'm trying to make this simple - of course there are all sorts of things that will reduce your taxes, taxes are tiered, etc. etc. This is very simplified. I'm just trying to show that a tax write-off is actual money someone is spending.